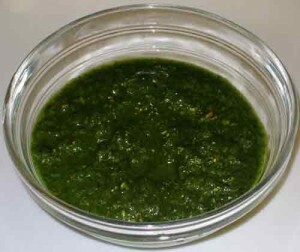 Green Chutney recipe by Mrs Durrani at DesiRecipes.com. A quick spicy chutney for any chaats, snacks and sandwiches. Green coriander (Dhania) (3 bunches). Mint Leaves (Pudina) (1 Bunch). Green Chillies (6)(or less if u want it less spicy). Wash the green coriander and mint leaves and along with green chillies. Now put all these with garlic cloves in a blender to blend it coarsly. Then add salt and crush pepper according to your taste and add yougurt to it.